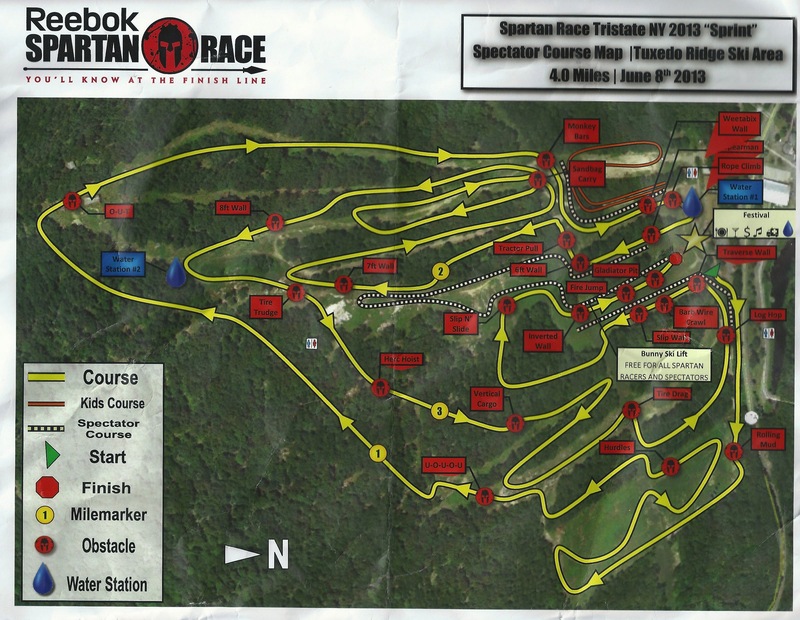 Yesterday, a group of friends and I did The Spartan Sprint at The Tuxedo Ridge Ski Center in NY. I decided to do this race as a challenge to see how far I have come since the surgery. I trained for it like a maniac in the months preceding the race. Despite all the training a quarter of the way through I was already saying “this is the hardest thing I have ever done in my life.” Not quite an exact quote but I want to keep this blog family friendly ;). There were 25 obstacles spread through the course. It rained pretty heavily the day before so the entire course was very muddy and slippery. For every obstacle a racer did not complete there was a 30 burpee penalty. I am going to focus on the obstacles that I think highlight the new abilities I have as a result of the surgery. The Hills – the whole course was going up and down steep hills. It was more like a hike than a run. Hiking up the trails required a lot weight shifting and balancing on one leg. The fact that the earth was drenched in mud made it pretty tough and I slipped and fell quite a few times. Hurdles – I had to traverse hurdles (going uphill) that were about 1.5 feet high. I used my hands to hop over the first hurdle and was scolded by one the monitors. Rather than risk doing 30 burpees I decided to try the next few hands free. Shockingly, I was able to get over the hurdles by stepping over one leg at a time. If you’ve been reading since the beginning you will remember how I struggled to step over cones in PT and when I hit the milestone of stepping over 12 inch cones. Before the surgery I struggled to step over 3 inch cones. Tire Trudge – I had to walk through a field of tires with nothing to hold on to. It was much easier than I expected it to be. As with the hurdles this would not have been possible pre op. I couldn’t lift my legs high enough and my balance on one leg was much worse. Sandbag Carry – I was supposed to carry a sandbag that was not really that heavy up a steep, muddy hill. I fell 3x right at the beginning and decided to skip it. The earth was just too slippery for me. Hellooooooooooooo burpees! Vertical Cargo Net – this one was a mixed bag. I got very close to the top of the cargo net but then I got stuck because I could not raise my right leg enough to make the next rung in the net. My hip flexion on the right side is still a work in progress. Luckily, my teammates were there to help me and push my right leg up. Boom! Once that happened I was able to get over the net down the other side. Fire Jump – I didn’t bother trying this one. Normally, I prefer to at least try an obstacle but the chance of landing in pile of burning coals didn’t seem worth the risk. Tractor Drag – I had a to drag a heavy cement block up a hill and then back down. This one wasn’t too bad to complete at all and was all powered by my legs. The rest of the obstacles were difficult but not as challenging as the obstacles mentioned above. My favorite obstacle was the Monkey Bars and my least favorite was the Barb Wire Crawl. My only goal was to finish. I failed 3.5 obstacles (Traverse Wall, Spear Throw, Fire Pit, and Rope Climb) and paid the burpee price; but I made it to end! As I sit here 24 hours later writing this post my body feels pretty good which is amazing considering what I just put it through. I have a lot of soreness in my right glute muscles but other than that I feel great. I hope reading this post gives other people considering the surgery a good idea of what might be possible. I was feeling pretty good about myself at the end of the race. You can check out some photos my friends captured here. Special thanks to Anna, Jarrett, Paul, Peter, Vasant, and Mitchell – it was definitely a team effort. So proud of you. Congrats! Thanks Deanna. And yes, I HATE burpees. Nice!!!!! Congrats!!!! I have to be honest and say I probably wouldn’t have finished. Thats insane! Well done mate. Respect! This is amazing! It’s been four years since my sdr, and i’m still working to run a mile a few times a week! You’re an inspiration. Keep being awesome! Thanks Rachel. Although to be fair, I didn’t have to run the whole course. Because some of the hills were so steep it was more like hiking than running a race! Congratulations Bro! Think you will be down to do another one? I am DEFINITELY doing it again. Join the team!